The project was split up in four phases; Phase 1 was the processing and interim haul of sub-base aggregate and crushed aggregate for granular base coarse (GBC) and asphalt cement paving (ACP). Phase 1 commenced in December 2014 and was completed by the end of February, 2015. A total of 202,400 tonnes sub-base, GBC – 80,000 tonnes and 50,000 tonnes of ACP aggregates was processed and stockpiled for the project. 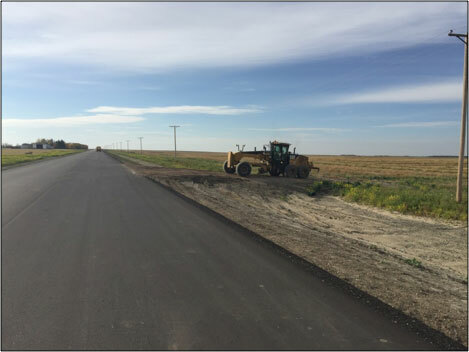 Phase 2 of the project was for the reconstruction of Hwy 21, through the Town of Kerrobert and comprised of earth excavation, adjusting manholes and catch basins, subgrade preparation, GBC in place and asphalt concrete (EPS) in-place on C.S. (Control Section) 21-12. This phase was scheduled to be completed by August 31, 2015. Phase 3 was defined as all road work on Hwy 51, C.S. 51-03, from kilometer 0.00 to 24.5 and consisted of subgrade preparation, placing GBC and paving ACP (EPS). The completion date for Phase 3 was scheduled for October 11, 2015. Phase 4, was the remaining 9.94 kilometers, C.S. 51-03 from km 24.50 to 34.44 and was scheduled for completion August 31, 2016. Due to an early spring in 2015 and a warm/dry summer, Carmacks was able to complete the entire project by August of 2015, a full year ahead of the contracted completion date of August 31, 2016.